Hot on the heels of Intel's reported acquisitive interest, Ethernet and InfiniBand networker Mellanox has closed out its final quarter of 2018 with an Ethernet-boosted bottom line. Tallying with last year's reported results, increased demand for cloudy and hyperscale storage drove the uptake. For its fourth quarter of fiscal 2018, ended 31 December '18, the firm reported $290.1m in revenues, up 22.1 per cent year-on-year, and $42.8m profit, up from a loss of $2.59m the year before. Mellanox chalked up its top line boost to "record sales" in its Ethernet switches and LinkX cables and transceivers segment. Cash and investments totalled $438.5m at year-end compared to $273.8m last year. 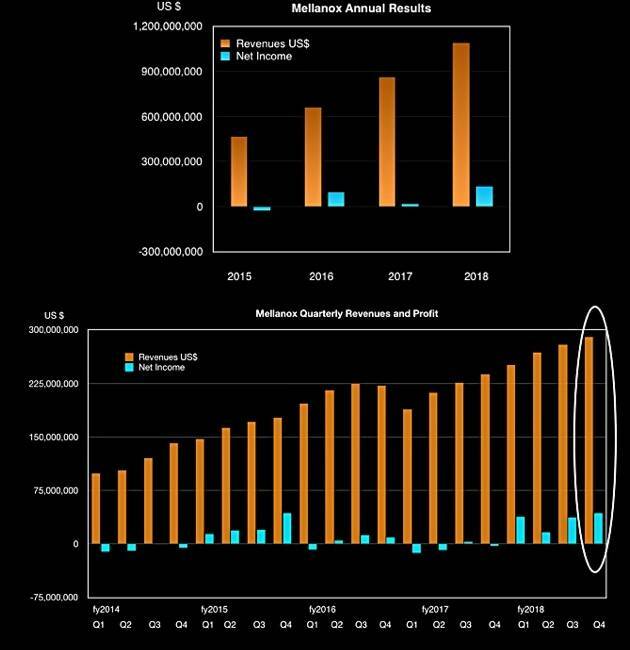 Mellanox's full year figures were $1.1bn in revenues, up 36 per cent annually, and a $134.3m profit compared to a $2.6m loss in fiscal '17. Ethernet sales rose 21 per cent year-on-year, with 25Gbit products selling well and the transition to 100Gbit tech starting; 2018 sales were 2.5 times those in 2017. InfiniBand sales grew less strongly; they were up 8 per cent on the year, with 200Gbit HDR product sales ramping up. It expects InfiniBand revenue to grow in the upper single to lower double-digit range in 2019 supported by the race to Exascale supercomputing. BlueField SoCs, which combine Ethernet and InfiniBand, are seeing traction as SmartNICs, storage controllers, and Edge computing devices. It’s seeing interest in BlueField as a storage controller from multiple large OEM, cloud and hyperscale customers who think it’s good for scale-out NVMe-over-Fabric storage arrays. A failing Omni-Path product tech would help explain Intel's interest in acquiring Mellanox. China is seen as a growth market by Mellanox, notwithstanding US-China trade tensions. Waldman was asked to compare the Chinese and US markets, and said: “First, in 2018, we grew very nicely, much more than in the US, in China" - without getting specific.